Unique appeal of traditional feel, Suitable for daily pooja, religious & wedding functions. Featuring an excellent finish. Washable and durable. Size of the product: 25.5" (L) x 25.5" (W) x 11.5" (H). This colorful red Bajot is made of wood and is perfect for using in meditation, pooja rooms & wedding functions. 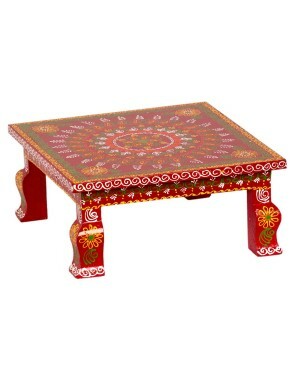 Decorated with hand painted patterns on top, this is definitely a great addition to your home. Attractively designed, the paintings are done using oil paints which does not wear off. The Bajot can also be washed before Pooja or any auspicious occasions. Highly skilled artisans work painstakingly and lovingly on each piece preserving its uniqueness and beauty to make it everlasting.